Background: In this fictional interview, the guest speaks entirely in quotes from Ecclesiastes, which may be my favorite book of the Bible because of its honest pessimism. I'm surprised that it's managed to remain in the canon of Christian scripture. The Speaker is under no delusions; he indulges in no wishful thinking about flying up to live happily ever after with the angels in heaven. The translation I've used is the Revised English Bible; I've indicated chapter and verse, while making cuts and slight punctuation changes and rearranging the verses as indicated. Welcome back to IT'S IN THE BIBLE. I'm Brother Billy. My next guest has been traveling around the world for many years, speaking to large audiences while portraying the character of a famous and wise king. This is his book; it's called Ecclesiastes, and IT'S IN THE BIBLE. I'd like to welcome to the program Mr. Solomon Redner! Glad to meet you, Mr. Redner. Now, your first name is, of course, is the same as the well-known King Solomon of Israel. And doesn't your last name, Redner, also mean something in your native German? Right. Or the Orator, or the Preacher, as it's sometimes translated. Now the king you impersonate, King Solomon, was famous for his wisdom. They say that he wrote 3,000 proverbs and 1,005 songs, although some of them might have been written by someone else using his name, such as yourself. I especially like the one about how everything has its time. How does that go? The straight truth! That's what we're all about here at IT'S IN THE BIBLE. And I'm told that you aren't afraid to speak the truth, Mr. Redner. Please favor us with some of Solomon's wise thoughts. Surely you aren't saying that our lives are meaningless? Well, what we do can make life better for future generations. We can create new things: art, or music, or . . . .
Or we can gain new understanding about life. You yourself have developed much knowledge. It's true that we often limit our thinking to our own lifespans. We forget the infinitely long time scales of God's universe. We must learn to appreciate the wonderful world that God has given us. You have lived in a palace; you must have seen much beauty. But where is your faith? Where is your hope? Being wise is better than the alternative, though, isn't it? I considered wisdom and madness and folly. I saw that wisdom is more profitable than folly, as light is more profitable than darkness; the wise person has eyes in his head, but the fool walks in the dark. But, of course, those who believe will have eternal life. Even the faithful are not resurrected? Surely we are better than mere animals. Let me remind our audience that the views expressed in the Bible are not necessarily the views of IT'S IN THE BIBLE. Do you mean that this life is the only one we will have? In other words, "Eat, drink, and be merry, for tomorrow we die"? Hmm. Let's move on to other issues, such as our capitalist economic system. But advancement and success are good. Don't you agree that achievement results from the competition to attain wealth? But under our system, even a poor man has a chance to improve his condition. What else can you do with your assets? Do you have any advice about diversified investments? Ah, something on which we can agree. Of course, we all trust that God's love will keep disasters from happening to us. How about this question: Does the punishment of criminals act as a deterrent against future crime? Amen, sir. Well, you've certainly given us some things to think about, but we're almost out of time. 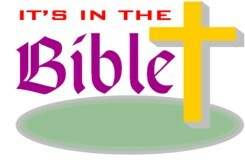 We've been talking with Solomon Redner this week on IT'S IN THE BIBLE. I'm Brother Billy. Any final words of wisdom, Mr. Redner? Delight in your youth, young man. Make the most of your early days. before the bad times come and the years draw near when you will say, "I have no pleasure in them,"
before the moon and the stars grow dim, and the clouds return with the rain. when people are afraid of a steep place and the street is full of terrors. Remember your Creator before the dust returns to the earth as it began.